Hi guys, Today techintor.com introducing one more VPN app to the free internet tricks category. The latest free internet giving vpn app called Twerk It VPN app. Its also called as tweakware vpn handler. 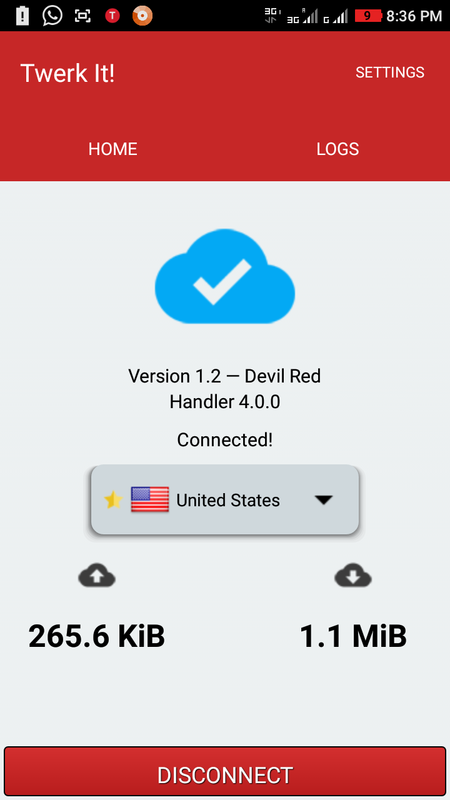 This is an android vpn app and therefore this trick work only for airtel android users. In this article, we are providing the ‘Airtel free internet trick using twerk it VPN handler for android users’ . The latest vpn app Twerk it VPN is very clean and easy to use. The very interesting this that we found in this latest vpn handler is, they have many high-speed free servers. Yeah, many of our techintor fans are messaging us that the free internet tricks are very slow and also they can’t enjoy true 4g or 3g with this free internet tricks. But guys, this low-speed problem is solved by this new twerk It VPN handler. Important Note- This trick doesn’t work with 2g network. You need 3g or 4g network to work this trick. If your airtel sim not connecting to 3g network in zero balance[without active 3g data pack], then use our exclusive trick to get 3g zero rental plan in airtel. Then you are able to use this trick. ** Features: No need of data pack. Working in zero balance. 4. Now save settings and connect the vpn. You are done, now enjoy free internet on your android sim with airtel sim using twerk it vpn. This Trick is personally tested in Kerala and working fine. Also, many of our users report this working in many states. Its working in almost all states. I hope you friends enjoyed this new Airtel free internet browsing and downloading trick. If this free internet trick for airtel sim worked on your android device then please share this article with your friends and help them too. better to keep a limit of 100Mb per day to avoid sim blocking. Can you give some tricks for PC. how I knw my sim is blocked??? No vpn is working in my phone now . earlier it was fine. how can i know whether my sim is blocked or not? yes you are right.it gives 250mb per month only…..
Once disconnect netify after that connect its take 30 days…..I am say right???? Airtellive pege is open it's working. It is 5n Working in pune Maharashtra .but from yesterday it is not working,is it sim blocked ? Brother anyone can help me ,to again work it.. It is not working bro..it works on first day oly.. This one is working like a charm. Do this guys. You may contact me at whatsapp. My no. is 8876534849. 1000% working. I am from Guwahati (Assam). This trick is works great in Tamil Nadu !!! I am from Karnataka twerkit connected in proxy 180.179.108.50 and one.airtel.in. Better to use internet 29 along with notify vpn. Kitna dete h per day? did u use more than 250 MB? currently, airtel free hosts have 250 mb per monthly limit. Thanks for all the work you have done.. you helped me a lot. I Have question if I would use different servers by changing it on every 100mb then will my sim remain unblocked?? or not?? give a limit for usage [100 MB is okay], then u will not be blocked.